This year, the Holiday Inn Express is the official hotel for the Hoosier Hoedown. The rate is $119 per night for a double or king room. Just inform them that you are in town for the aerobatic contest, the Hoosier Hoedown. The Holiday Inn Express is located two miles south of Chrysler and Delphi. Enjoy our hot, complimentary Express Start Breakfast bar daily. Hotel also includes a 756 square foot meeting room, fitness center, indoor pool, business center and guest laundry. Enjoy our evening social hour Monday - Thursday. Tags: hotels 511 Albany Dr.
Hotel offers both king and queen rooms, indoor pool, and continental breakfast. Tags: hotels 522 Essex Dr.
Hotel offers an outdoor pool and standard in-room amenities include free Wi-Fi Internet access, and apartment-style rooms with a kitchenette, refrigerator and microwave are available. Efficiency suites, business king rooms, and handicapped- accessible rooms are also available. Pets are welcome. Indoor pool and hot tub, continental breakfast, meeting room, suite with king sized bed, sofa, refrigerator, microwave, hospital rates, funeral rates and group rates are available. Tags: hotels 1717 E. Lincoln Rd. Hotel offers two conference rooms and standard and extended stay rooms. Daily and weekly rates are available. Tags: hotels 4021 S. Lafountain St.
Our promise to you includes a clean, comfortable hotel room. If you're traveling with your family, try one of the hotel's suites or a room with two beds. If you are here by yourself on business, why not book a room with a plush, king-sized bed. We offer com plimentary Hot Breakfast and high- speed Internet to all our guests. Get FREE high-speed wireless Internet access at this Courtyard. Check into the Courtyard Kokomo and check out our award-winning accommodations & warm, friendly staff. Take some time to relax in our indoor swimming pool or workout in our fitness center. Rise & shine the next morning to a delicious breakfast in the Bistro. 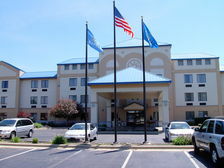 When traveling to Kokomo, visit the conveniently located Courtyard and experience exceptional accommodations and a warm, friendly staff fully committed to your complete comfort and satisfaction.Tags: hotels 411 Kentucky Dr. This motel offers eight rooms and weekly discounts. Tags: hotels 4112 N. - 00 E.W. Enjoy a comfortable, pet-friendly environment with free Wi-Fi in select rooms. All guest rooms feature coffee makers with free coffee, pillow-top mat tresses, voice mail, curved shower rods, hair dryers, irons, ironing boards, and cable television. Some rooms have microwaves and refrigerators. Ask about our suites that have hot tubs, desks, and sofa sleepers. Non-smoking and connecting rooms can be requested. Amenities include indoor heated pool, king and queen size rooms available, data ports available in all rooms, continental breakfast, and pets are accepted. Tags: hotels 5110 Clinton Dr. The Hideaway offers women a get-a-way weekend to relax, socialize, and enjoy craft projects, whether it be scrapbooking, stamping, jewelry making, sewing or quilting. Each guest can bring their own craft projects and have uninterrupted hours of time to preserve memories for your families to cherish for years to come. This unique guest ranch offers horse and buggy rides, stocked fishing pond, billiards room, wood burning fireplace, extensive water gardens, canoeing on Wildcat Creek, space for outdoor wed- dings, and free programs during the year, including outdoor outings, photography, and art programs. Lodging options includes cabin or woolywagon. Camping is also available. Campground open seasonally April 1 - November 1. Fishing lake, RV hook-up facilities & showers/restrooms.